Already have an asphalt driveway or parking area and just looking to extend it to accommodate more vehicles? 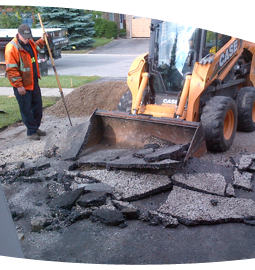 Is your asphalt driveway or parking lot in good condition save and except a spot here or there? Then a Paving Extension or Asphalt Patching will solve your problems! Using premium Hot-Mix Asphalt, we can upsize your current driveway or parking area to accommodate for more usable parking space. Using the same methods as with our regular Paving Service, we can install a paving extension to meet your needs. If your driveway or parking lot is just in need of sporadic area repair to address damaged asphalt or grading concerns, and sub-base issues are not the cause for the current damage, then Asphalt Overlay Patching may be the answer! If sub-base issues are suspected to the cause for the current asphalt failure, then we can remove & replace only sections of damaged asphalt, leaving all asphalt that is in satisfactory condition intact.